An entire generation is in grave danger. The #childrenofsyria are watching their futures slip away. They desperately want and need to go to school. To be protected. To be comforted. The United Nations and its humanitarian partners today appealed for $1 billion to save millions of Syrian children from becoming a “lost generation,” doomed by the civil war in their country to a life of despair, diminished opportunities and broken futures. "The future for these children is slipping away, but there is still a chance to save them," UN High Commissioner for Refugees António Guterres said at the unveiling of the “No Lost Generation" initiative in Geneva, one week ahead of a major donor conference in Kuwait for humanitarian aid for Syria. "The world must answer this crisis with immediate, massive international support." Launched by the UN Children’s Fund (UNICEF), the UN refugee agency (UNHCR), Save the Children, World Vision and other non-governmental organization (NGO) partners, the initiative calls for Governments, aid agencies the ordinary public to champion the children of Syria, where well over 100,000 people have been killed and 8 million others driven from their homes, 2 million of them as refugees in neighbouring countries, since the conflict erupted in March 2011. It calls for a major investment in ensuring safe education and protection from violence, exploitation and abuse for over 4 million children, and a major public engagement campaign under the hashtag #childrenofsyria is being launched, using social media to enlist influential supporters and public contributors. “For nearly three years, Syria's children have been the most vulnerable of all victims of the conflict, seeing their families and loved ones killed, their schools destroyed and their hopes eroded,” the agencies said in a joint news release. Over 1 million refugees are children, more than 425,000 of them under the age of five, the vast majority of them in to Lebanon, Jordan, Turkey, Egypt and Iraq. Nearly 8,000 of these children have been identified as separated from their immediate families. The situation is even more dire for the over 3 million displaced children inside Syria, where much of the country has been consumed by bloody fighting since the conflict first erupted between forces loyal to President Bashar al-Assad and initially peaceful opponents seeking to oust him. The UN agencies and their partners said they would channel the $1 billion into programmes that, in partnership with Governments and local communities, deliver safe education, protection from exploitation, abuse and violence, psychological support, and offer more opportunities for social cohesion and stability in an already volatile region. This includes strengthening national and community-based child protection systems, which respond to the needs of girls, boys and families at high risk of abuse, neglect, exploitation and violence while protecting all children against such risks. The initiative will also scale up access to quality education, through formal and non-formal approaches, introducing accelerated curricula for children who have been out of school, vocational and teacher training and incentive programmes, creating safe environments that further reduce children's exposure to further risks. Inside Syria, safe access to education for displaced children and adolescents is absolutely critical. The "No Lost Generation" initiative will provide remedial education and psychosocial support organized in school clubs for pre-schoolers and other out-of-school children. "Without these urgent investments, millions of Syrian children may never recover from so much loss and fear," Mr. Guterres said. "Their future, and the future of their nation, is at stake." A special website has been established at http://www.championthechildrenofsyria.org that tells the stories of children affected by the conflict, and shows how investments in children can deliver important dividends, not just for the current victims of the war but for the longer-term future of Syria and the wider region. 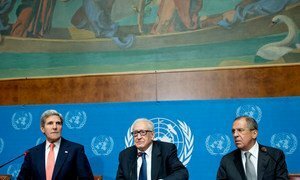 Preparations for the long-sought international conference on Syria are moving ahead, with the United Nations reaching out to the more than 30 participating Member States and with a call on the Syrian opposition to name members of its delegations.